When I gave birth to my first son Henry over seven years ago, my circumstances were much different. We had just bought our first house, and after sinking every penny, we had into our deposit we had little left over for furniture or baby essentials. 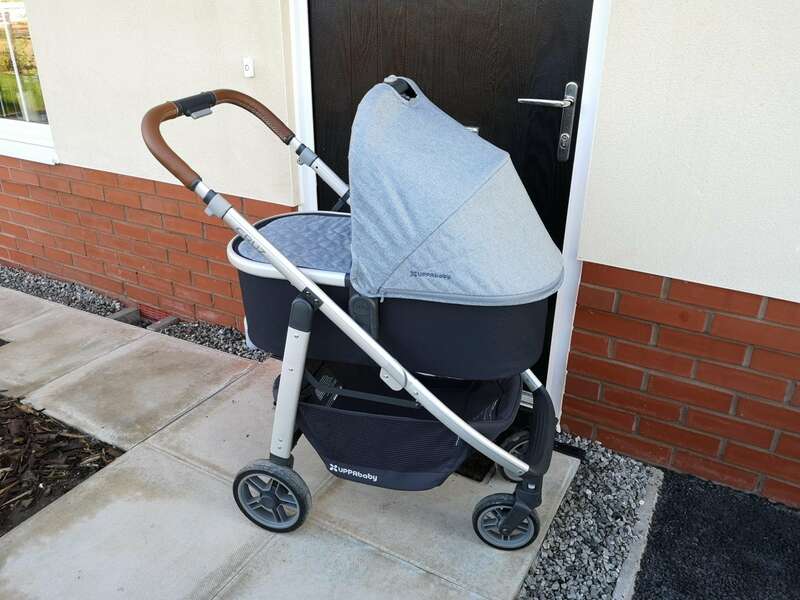 Despite having always wanted a fancy travel system it just wasn’t going to be possible and instead I reluctantly settled for something much more affordable. What I actually ended up with was a bulky, heavy pram that would drag to one side when pushing. It was a false economy because buying cheaply resulted in me not using the product at all. In fact, I can probably count on my hand the number of times that item was used, and as a result, poor Henry didn’t get out that much!! Almost as soon as I was pregnant with Hugo, I knew that I wanted to get it right this time and I was going to learn from my past mistakes. I must have tried every travel system going from one end of the country to the next, and I was exceptionally critical of the weight, feel and size. This time around I would have a child in tow, so I needed something easy to fold, lightweight and of course aesthetically pleasing. 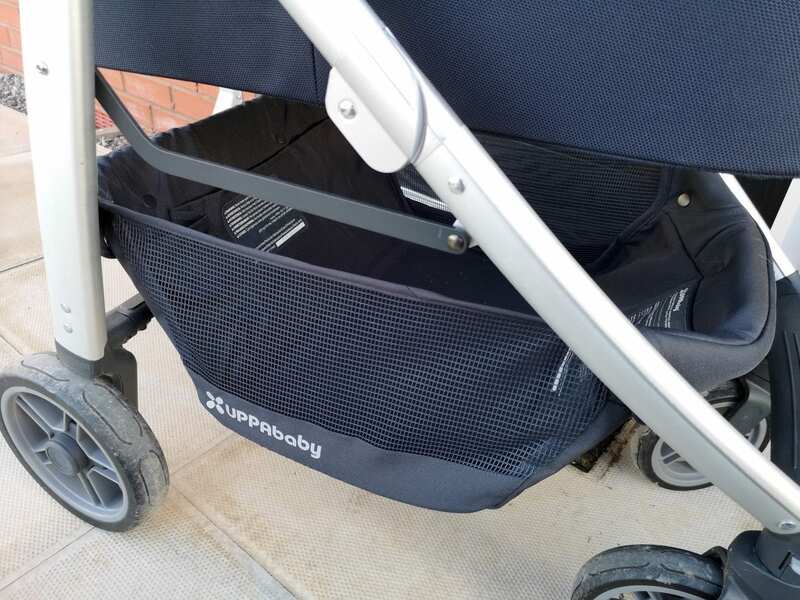 I asked everyone, and anyone about their recommendations and one brand that I repeatedly heard good things about was UPPAbaby. So I scoured their website, and the UPPAbaby Cruz was ticking all of my boxes! When the package containing the UPPAbaby Cruz arrived, I was filled with dread that it was going to be a huge build job. You know the kind I mean? One which involves lots of obscure tools that no one actually owns. I couldn’t have been more wrong though because my husband Ollie had it out of the box and built before the kettle had even boiled! It was as simple as attaching the wheels and clicking in the newborn bassinet! Not that I’m one to doubt my husband, but I do admit I did check to make sure he hadn’t missed any crucial steps and I was pleasantly surprised to learn that it really was that simple. So simple in fact I could have just done it myself!! Admittedly we could have placed Hugo into the bassinet and been off on our first adventure, but I did spend a few moments just admiring it. The build quality was excellent, and it was everything visually I had wanted. It was easy and smooth to push, and the leather handles just complimented everything perfectly. It was notably lightweight but not ‘wispy’ like it would blow away at the first sign of a sneeze and oh my did it fold up neatly and easily. When people talk about love, at first sight,, this is what they mean! 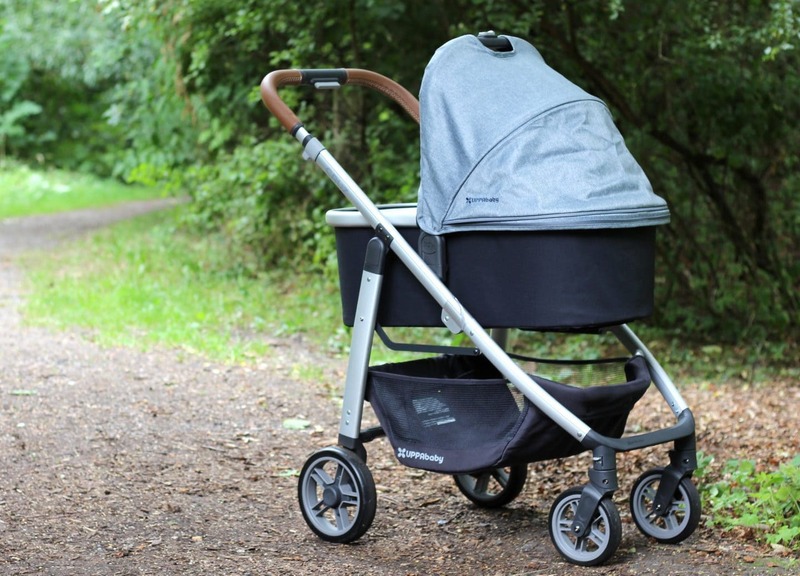 It sounds extreme and eccentric, but it had taken seven years and two babies to get my dream travel system I wasn’t going to let this moment pass without admiration! 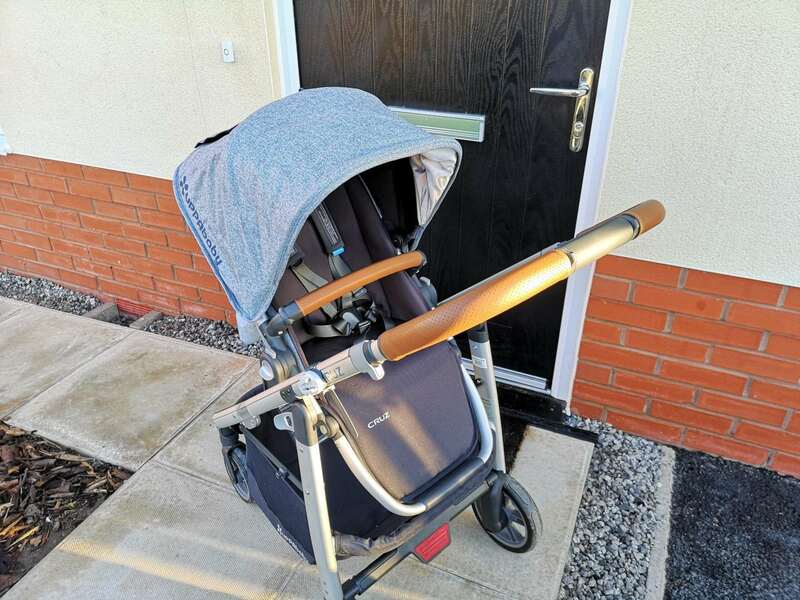 The UPPAbaby Cruz has a welded aluminium alloy frame and comes complete with a toddler seat, toddler seat rain shield, bug shield and bumper bar. The frame is slim making navigating tighter corridors easy and is the perfect accessory for living in a busy city as we do. Despite the compact design, there is no compromise on stability! 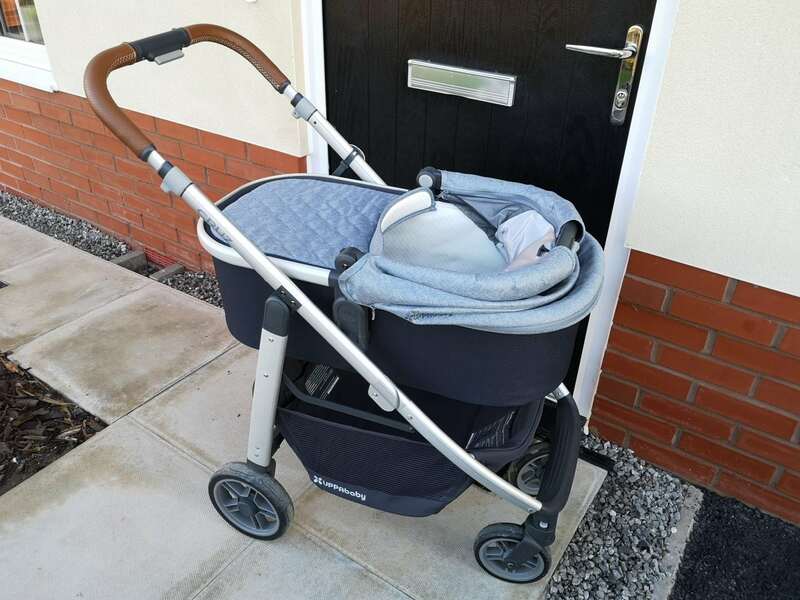 The front wheels swivel for ease and, but they also lock into place too for safety but also useful if you are pushing the pram back and forth to initiate sleep!! Having a four-wheel suspension means that it’s a smooth ride even when going off road which means you can worry less about your babies waking up once you’ve finally got them to sleep! There is also an extra large shopping basket which holds a fair few shopping bags. On a daily basis, we have Henry’s school bag, the change bag, a spare blanket and coats for the whole family and there is still ample room! It makes shopping trips a breeze and means that I can quite happily buy bulky items like nappies, wipes and kitchen roll and have somewhere to put them all without trying to balance them on the pram like a dangerous game of Jenga!!! The Toddler seat is a good comfortable size and comes with a bumper bar. 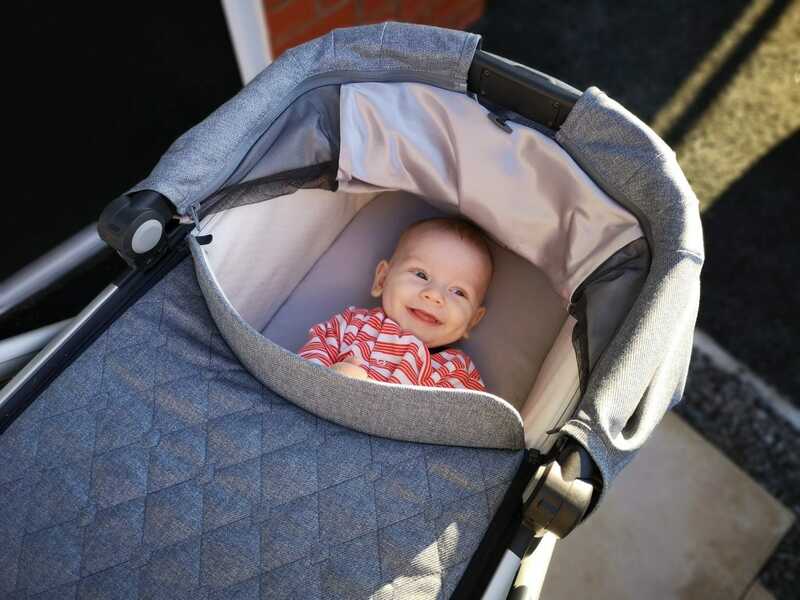 It’s suitable for use from 6 months old and the great feature is that you can have it parent facing so you can interact or world facing so they can take in their surroundings. I like having the option of both, and I think while Hugo is younger parent facing will be the most ideal, but as he grows older, he will be more and more curious about seeing the world around him. You can also use the UPPAbaby Cruz with specific car seats if you use the correct adapters. This isn’t a feature we have used yet but only because we haven’t had a need for it, but it would be great for those quick trips to the supermarket or on the school run! 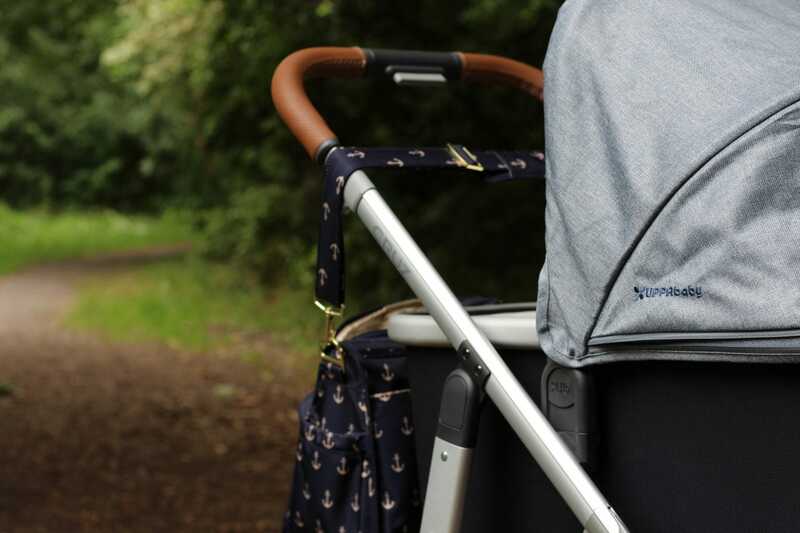 The UPPAbaby Cruz is available in a range of gorgeous colours perfect for any taste! I fell in love with ‘Gregory’ which is a beautiful blue/grey with 100% full grain leather accents on the handle and bumper bar! The leather on the handlebar is even hand sewn which is just a beautiful touch! 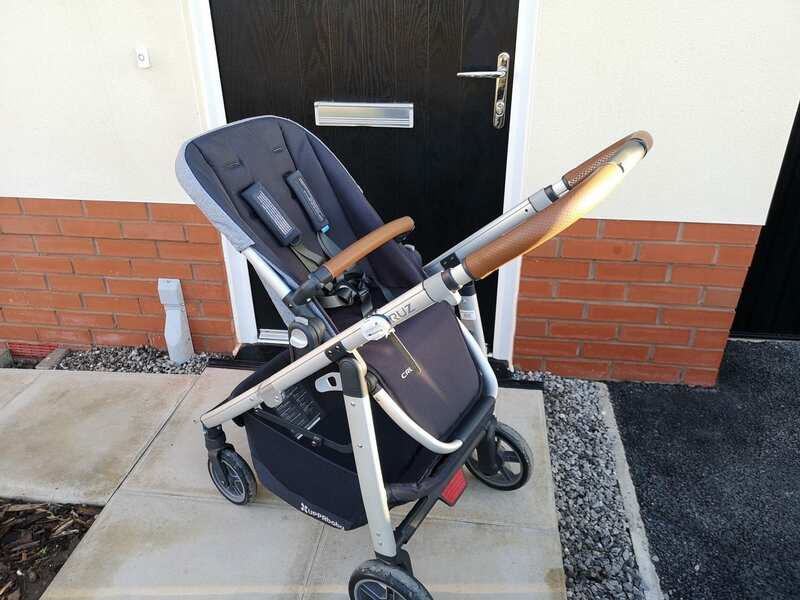 Finally, when it comes the folding the pushchair up this can be done with or without the toddler seat attached which saves time, energy and hassles especially if you have an overtired child in tow! 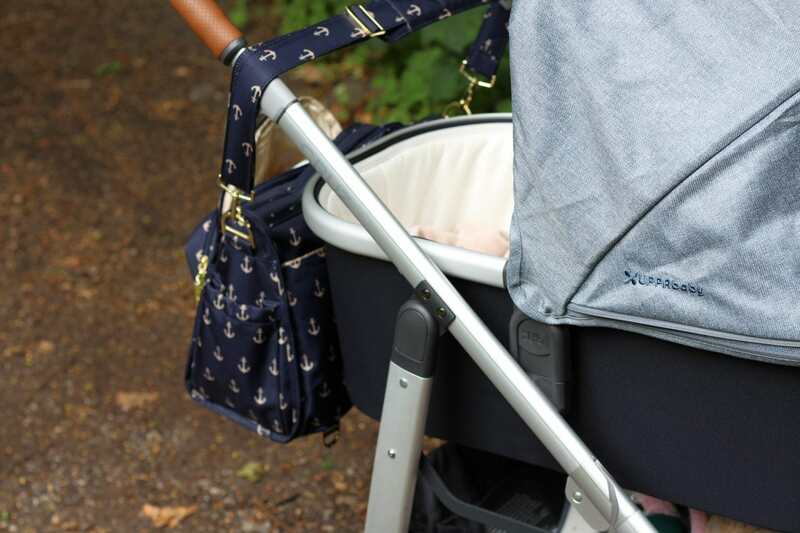 \The UPPAbaby Cruz is perfect for age 6 months plus but if like us you want to use from birth that is entirely possible too using the Uppababy Carrycot or Infant SnugSeat Insert. 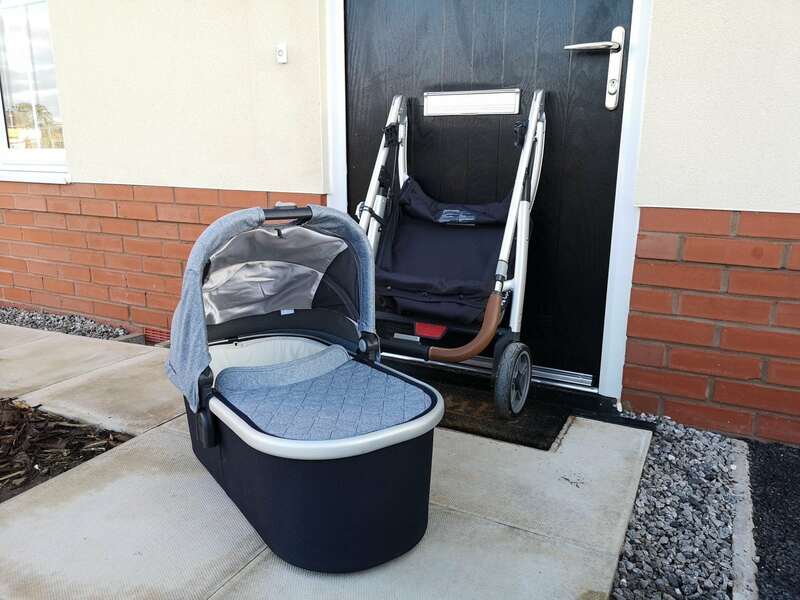 We have been using the Carrycot, and it has been perfect for our little newborn! 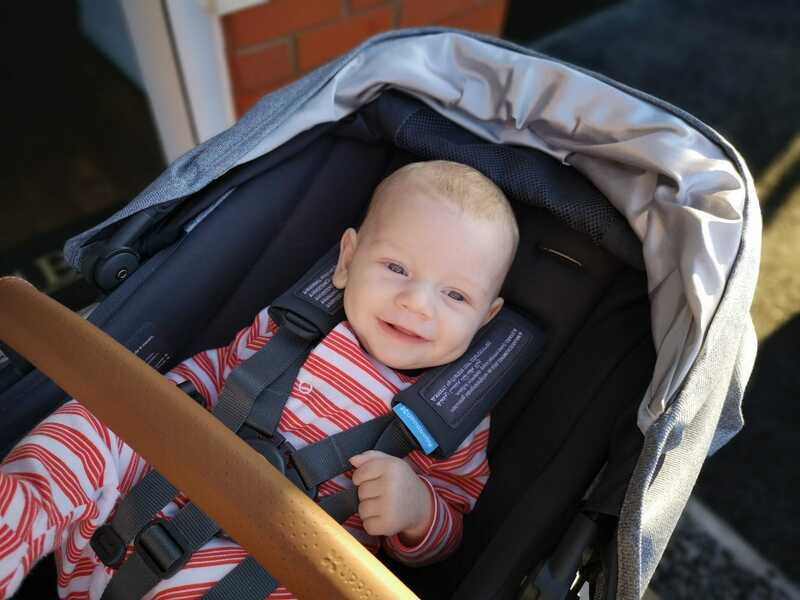 Find out more about our experience with the Carrycot here. 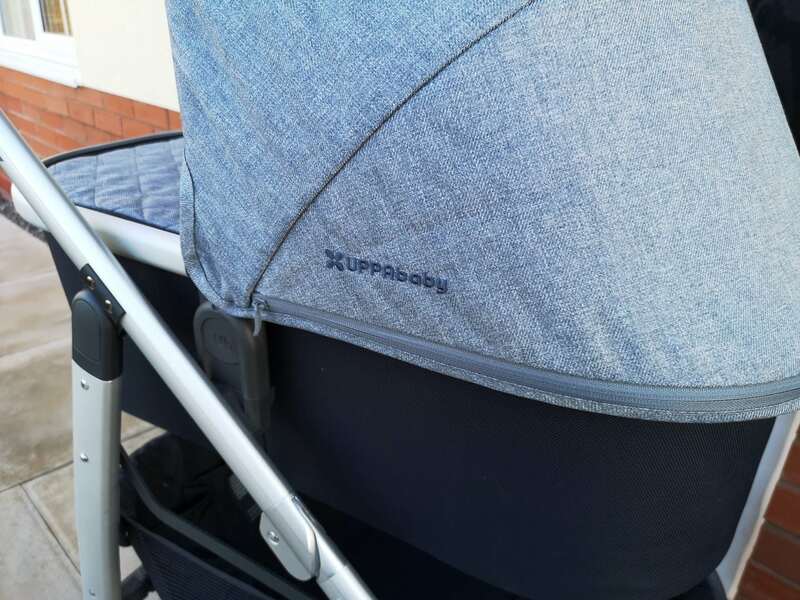 We have been using our UPPAbaby Cruz and the Carrycot for the past five months, and if I am honest, I have nothing negative to say about it. I wouldn’t change it, and if I were to have any more children, I would absolutely choose it again. 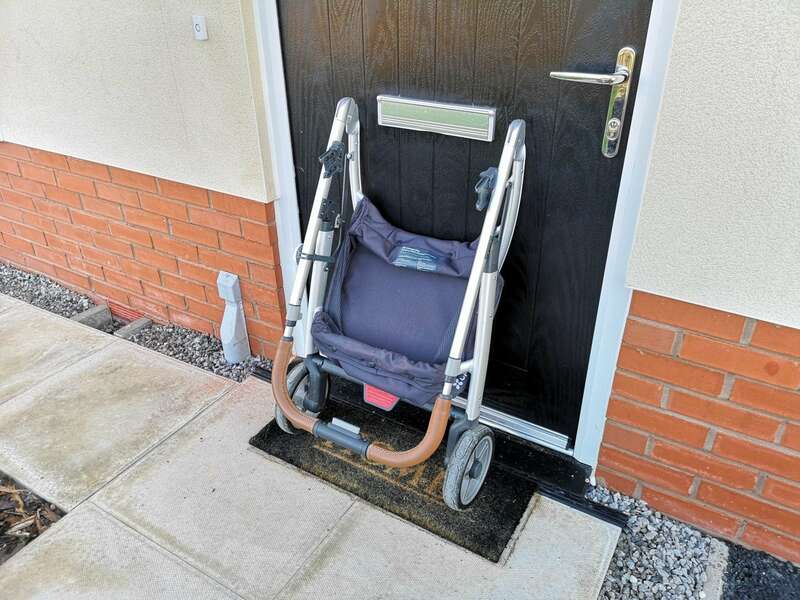 Having this stroller has given me confidence and independence because it’s so easy to manoeuvre, fold and use. It doesn’t matter whether I am whizzing around the busy streets of Manchester centre doing a spot of shopping or going off-roading on a dog walk I’m not held back and having a seven-year-old in tow that has been the most helpful thing for me! 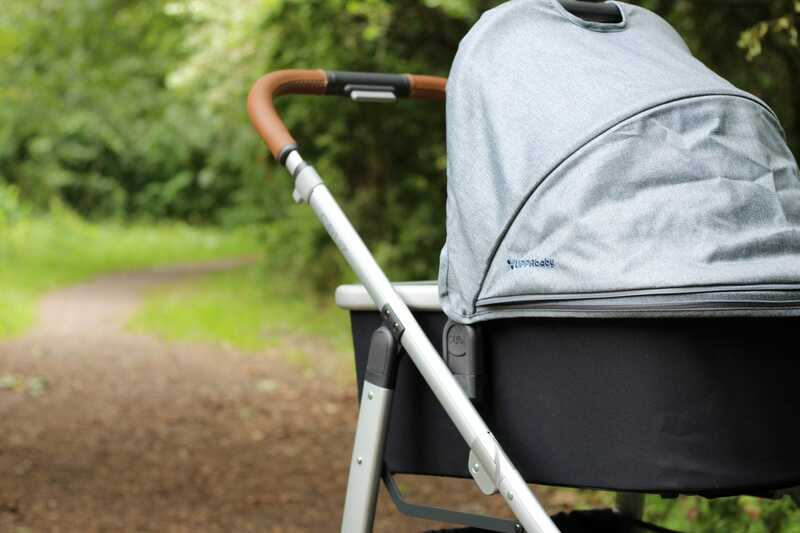 The UPPAbaby Cruz is currently £599.00 in John Lewis, and the Carrycot is available for £259.99. Although it sounds like a considerable initial outlay cost wise when you look at the market and what is available the price is fair, and when you take functionality and build quality into consideration I actually think this is a great price. 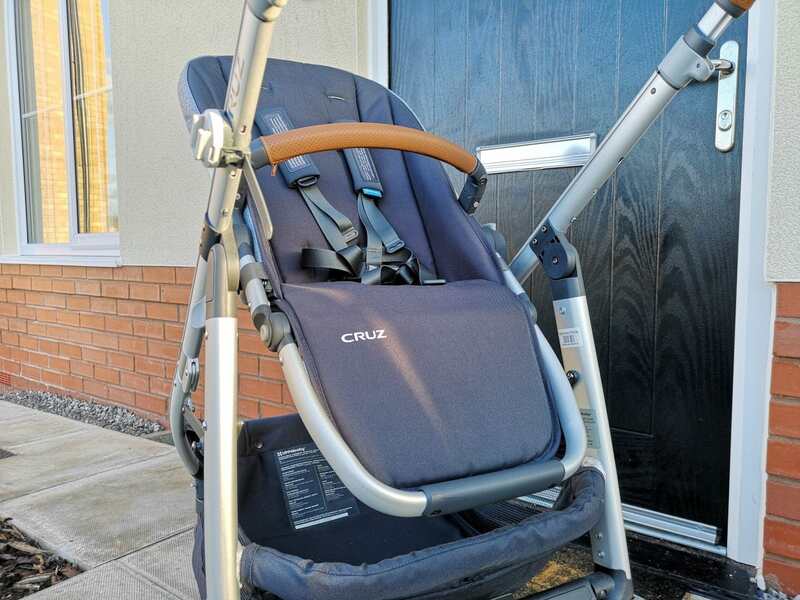 You can find out more about the UPPAbaby Cruz on their website here.